The Current Apartments are located in Long Beach, California. They are still under construction. 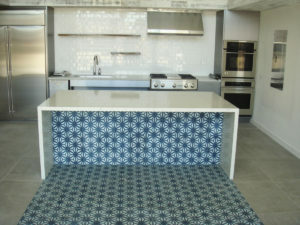 This project had been specified with two quartz colors from a company based in Israel. 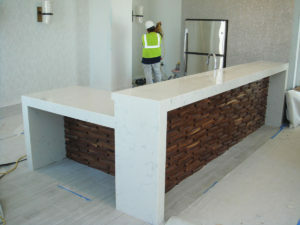 The design team and owner were stuck on the colors, but were not happy with the cost of material. The project was already over budget. Building owners are concerned about their return on investment (ROI). Stone Ally makes sure that they achieve it. With the project already over budget, we realized that ordering the specified product would not achieve the desired financial results. Stone Ally has vendors worldwide. We sent the specified samples to our Chinese Quartz factory. They were able to copy the samples within two weeks and send them back for approval. The samples were exactly what the designer wanted and they met the budget criteria for the building owner. We supplied the product on time and within budget. 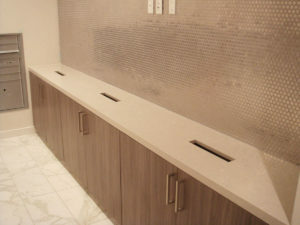 Quartz has become the counter material of choice for multi-family, commercial residential projects. It is as durable as granite, but it does not have the natural imperfections or color variations found in marble. We have been working with a Chinese Quartz company for the past three years and have had an excellent track record with them. 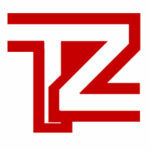 We are proud to offer several quartz products to the trade.